When you look at the many ways that women’s sports in nonprofit universities are pushed into the margins, it becomes clear why a comprehensive effort is needed to reverse the tide. It should be no surprise that obesity is caused by more than just a lack of food options. 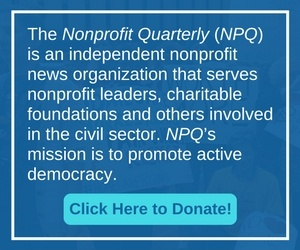 As Baby Boomers begin to retire from their long-term CEO roles with nonprofits, the best of them will leave behind their thoughts about what makes an extraordinary nonprofit executive, and NPQ intends to reprint the best of these for widest possible distribution. Twitter and Facebook have long been the most popular social media outlets, but they are starting to show their age. How can your organization use more current online platforms to its advantage? Preliminary results from the Ann Arbor Area Community Foundation’s new study show that local arts and culture nonprofits have had an astounding economic impact. A nonprofit buys a major civic venue through a process that required many steps and more partners. D.C. Central Kitchen has released a guide to replication of its “Healthy Corners” program as a way to fight food deserts. Women nurses outnumber male nurses by more than ten to one. Why, then, do male nurses make so much more?